These high-performing Abu Garcia Ambassadeur 2007 Round Big Game Reels are ideal for battling the top of the food chain, and they’re loaded with more power and features than ever! Beefed up big time, these workhorses are equipped with a synchronized levelwind, a tough aluminum spool, Carbon Matrix Drag system delivers minimal start-up friction, smooth brass gears, clicker, 2 shielded stainless steel ball bearings (on model 7000iHSN only) and corrosion-resistant instant anti-reverse bearing. "These Big Game reels offer stronger than ever gears and the best drag Abu Garcia has ever built. I only wish they offered brass sideplates like they used to. Still, great reels!" "I often go tuna fishing, which demands a reel with a very powerful drag and a reel that can stand up to the constant beating of hauling in large yellowfin tuna and the corrosion of saltwater. 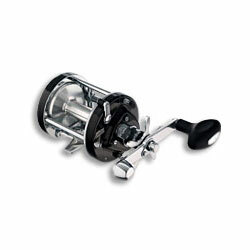 For 12 years, I have striven to find the perfect reel for my tuna fishing, and finally I have found this one."